With the marathon quickly approaching I had to make a choice…stop drinking for a little while or keep this column alive. Well I have to inform you that I had my last pre-marathon beer at cork city pub this week. Cork City Pub is located at the corner of Bloomfield and 3rd street and took over this location from Duffy’s around a year ago. They re-did the outside (and I assume some of the inside but I wouldn’t know for sure since I had never gone into Duffy’s during its existence.) 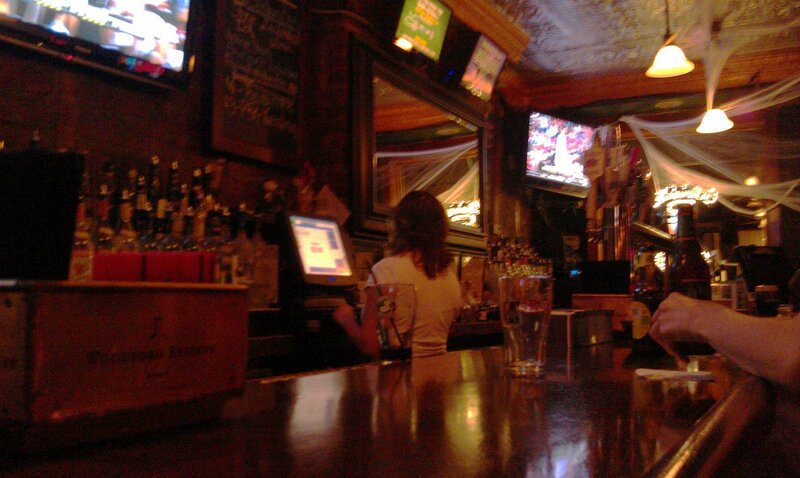 I walked inside Duffy’s on a chilly Wednesday night and grabbed a seat at the far end of the bar. I was drinking alone on this night which is always a little awkward especially when walking into a neighborhood place. As I sat down I ordered an Alagash White which was very tasty. There seems to be a ongoing theme with most of the places I have been to recently in Hoboken…they are very neighborhoody. So on this Wednesday when I walked in, one patron was chatting with the bartender about job prospects with a couple of other people sitting at the bar and conversing. As the night moved on more and more people filed in, filling up nearly all of the seats at the bar as well as the table in the center of the room. Everyone was engaged in some serious conversation. I honestly never have heard a bar in Hoboken that loud just based on conversations alone. The murmur overtook the eclectic music (I think “Boom Boom Pow” led into “Born to Run”). The bar was very very dark inside. So dark that it made it very difficult for this writer to take any pictures that would come out. The built in flash was just no match for the darkness. There were some Halloween decorations up on the wall getting ready for the big nights of drinking this weekend. At the side of the bar was a couple of nice dart boards but they were in the dark…although I am sure they would turn on the lights in that area if anyone asked. Besides having your standard number of hd tvs up around the place, Cork City also had a couple of closed circuit tvs behind the bar. Those tvs were actually very helpful as they showed off special pictures from past events as well as my favorite thing…beer reviews. It’s always a little intimidating looking at a bunch of draughts or bottles that you are unfamiliar with and trying to decide what to drink. You certainly don’t want to take a chance on picking a beer that has a terrible taste. I know I tend to be very unadventurous and usually end up going with something I have had before to avoid going with a dud. That said, these beer reviews gave ratings and great descriptions of the taste of the beers similar to what you would find in the wine section of a liquor store. If I would have stuck around much later I definitely would have grabbed one of the beers they were suggesting. Before I get to the breakdown I wanted to share two more of my favorite things about Cork City. First off, they had cheese balls at the bar. I love cheese balls all the time but even moreso when I am drinking. In college I often woke up many mornings with a hangover and orange fingerprints all over the place. These cheese balls brought me back to that- although I was a little unsure about licking my fingers and putting them back into the bowl…seemed not right to do in public. Secondly, Cork City has/had a great beer club. I know it took place during the summer but I believe it is still going on. They have an extensive list of beers to try and at the end you get your name on a plaque a shirt and a $50 gift card…not too bad and the number of beers you have to drink isn’t as daunting as some other beer clubs in town. Preconceived notion – I had never had been to Cork City before. It seemed like your normal Irish bar from the outside. Music – All over the place…classic rock to modern pop. Value – Beers were fairly priced. They also have a $35 open bar for parties which is a very good deal. Overall – There is a sign up in the bar that says Cork City loves beer… And honestly if you love beer you will love Cork City. Their Great American Beer Challenge seems innovative, rewarding, and well organized. 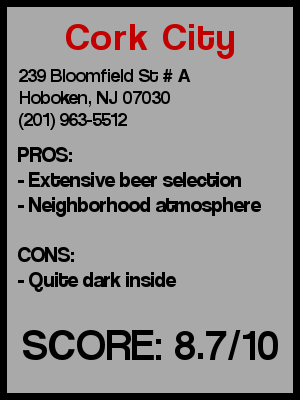 They carry beers that you can’t find anywhere else in Hoboken and offer tastings of other beers. This is as good of a beer heaven as you can find with a neighborhood feel. 8.7/10.